We interpret the purely spectral forward Maxwell equation with up to third-order induced polarizations for pulse propagation and interactions in quadratic nonlinear crystals. The interpreted equation, also named the nonlinear wave equation in the frequency domain, includes quadratic and cubic nonlinearities, delayed Raman effects, and anisotropic nonlinearities. The full potential of this wave equation is demonstrated by investigating simulations of solitons generated in the process of ultrafast cascaded second-harmonic generation. We show that a balance in the soliton delay can be achieved due to competition between self-steepening, Raman effects, and self-steepening-like effects from cascading originating in the group-velocity mismatch between the pump and the second harmonic. We analyze the first-order contributions, and show that this balance can be broken to create fast or slow pulses. Through further simulations we demonstrate few-cycle compressed solitons in extremely short crystals, where spectral phenomena, such as blue/red shifting, nonstationary radiation in accordance with the nonlocal phase-matching condition, and dispersive-wave generation are observed and marked, which helps improve the experimental knowledge of cascading nonlinear soliton pulse compression. R. DeSalvo, D. Hagan, M. Sheik-Bahae, G. Stegeman, E. Van Stryland, and H. Vanherzeele, “Self-focusing and self-defocusing by cascaded second-order effects in KTP,” Opt. Lett. 17, 28–30 (1992). S. Ashihara, J. Nishina, T. Shimura, and K. Kuroda, “Soliton compression of femtosecond pulses in quadratic media,” J. Opt. Soc. Am. B 19, 2505–2510 (2002). J. Moses and F. Wise, “Soliton compression in quadratic media: high-energy few-cycle pulses with a frequency-doubling crystal,” Opt. Lett. 31, 1881–1883 (2006). B. Zhou, A. Chong, F. Wise, and M. Bache, “Ultrafast and octave-spanning optical nonlinearities from strongly phase-mismatched quadratic interactions,” Phys. Rev. Lett. 109, 043902 (2012). D. Nikogosian, Nonlinear Optical Crystals: A Complete Survey (Springer, 2005). T. Kartalo?lu, K. Köprülü, O. Aytür, M. Sundheimer, and W. Risk, “Femtosecond optical parametric oscillator based on periodically poled KTiOPO4,” Opt. Lett. 23, 61–63 (1998). M. Sundheimer, C. Bosshard, E. Van Stryland, G. Stegeman, and J. Bierlein, “Large nonlinear phase modulation in quasi-phase-matched KTP waveguides as a result of cascaded second-order processes,” Opt. Lett. 18, 1397–1399 (1993). S. Ashihara, T. Shimura, K. Kuroda, N. Yu, S. Kurimura, K. Kitamura, M. Cha, and T. Taira, “Optical pulse compression using cascaded quadratic nonlinearities in periodically poled lithium niobate,” Appl. Phys. Lett. 84, 1055–1058 (2004). M. Arbore, O. Marco, and M. Fejer, “Pulse compression during second-harmonic generation in aperiodic quasi-phase-matching gratings,” Opt. Lett. 22, 865–867 (1997). C. Phillips, C. Langrock, J. Pelc, M. Fejer, I. Hartl, and M. Fermann, “Supercontinuum generation in quasi-phasematched waveguides,” Opt. Express 19, 18754–18773 (2011). J. Moses and F. Wise, “Controllable self-steepening of ultrashort pulses in quadratic nonlinear media,” Phys. Rev. Lett. 97, 73903 (2006). F. Ilday, K. Beckwitt, Y. Chen, H. Lim, and F. Wise, “Controllable Raman-like nonlinearities from nonstationary, cascaded quadratic processes,” J. Opt. Soc. Am. B 21, 376–383 (2004). C. Menyuk, R. Schiek, and L. Torner, “Solitary waves due to ?(2):? (2) cascading,” J. Opt. Soc. Am. B 11, 2434–2443 (1994). M. Bache, O. Bang, J. Moses, and F. Wise, “Nonlocal explanation of stationary and nonstationary regimes in cascaded soliton pulse compression,” Opt. Lett. 32, 2490–2492 (2007). M. Bache, J. Moses, and F. Wise, “Scaling laws for soliton pulse compression by cascaded quadratic nonlinearities,” J. Opt. Soc. Am. B 24, 2752–2762 (2007). M. Bache, O. Bang, W. Krolikowski, J. Moses, and F. Wise, “Limits to compression with cascaded quadratic soliton compressors,” Opt. Express 16, 3273–3287 (2008). M. Kolesik, P. Townsend, and J. Moloney, “Theory and simulation of ultrafast intense pulse propagation in extended media,” IEEE J. Sel. Top. Quantum Electron. 18, 494–506(2012). R. Bullough, P. Jack, P. Kitchenside, and R. Saunders, “Solitons in laser physics,” Phys. Scr. 20, 364–381 (1979). 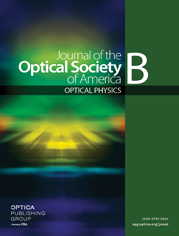 A. Husakou and J. Herrmann, “Supercontinuum generation of higher-order solitons by fission in photonic crystal fibers,” Phys. Rev. Lett. 87, 203901(4) (2001). M. Conforti, F. Baronio, and C. De Angelis, “Nonlinear envelope equation for broadband optical pulses in quadratic media,” Phys. Rev. A 81, 053841(4) (2010). R. Boyd, Nonlinear Optics (Academic, 2003). M. Conforti, F. Baronio, and C. De Angelis, “Modelling of broadband and single cycle phenomena in anisotropic quadratic crystals,” J. Opt. Soc. Am. B 28, 1231–1237 (2011). M. Kolesik and J. Moloney, “Nonlinear optical pulse propagation simulation: from Maxwells to unidirectional equations,” Phys. Rev. E 70, 036604 (2004). M. Bache and F. Wise, “Type-I cascaded quadratic soliton compression in lithium niobate: compressing femtosecond pulses from high-power fiber lasers,” Phys. Rev. A 81, 053815 (2010). P. Banks, M. Feit, and M. Perry, “High-intensity third-harmonic generation,” J. Opt. Soc. Am. B 19, 102–118 (2002). M. Bache, H. Guo, B. Zhou, and X. Zeng, “The anisotropic Kerr nonlinear refractive index of ?-BaB2O4,” arXiv:1209.3158 [physics.optics], (2012). G. Valiulis, V. Jukna, O. Jedrkiewicz, M. Clerici, E. Rubino, and P. DiTrapani, “Propagation dynamics and x-pulse formation in phase-mismatched second-harmonic generation,” Phys. Rev. A 83, 043834 (2011). G. Stegeman, D. Hagan, and L. Torner, “? (2) cascading phenomena and their applications to all-optical signal processing, mode-locking, pulse compression and solitons,” Opt. Quantum Electron. 28, 1691–1740 (1996). M. Bache, F. Eilenberger, and S. Minardi, “Higher-order Kerr effect and harmonic cascading in gases,” Opt. Lett. 37, 4612–4614 (2012). M. Sheik-Bahae, D. Hutchings, D. Hagan, and E. Van Stryland, “Dispersion of bound electron nonlinear refraction in solids,” IEEE J. Quantum Electron. 27, 1296–1309 (1991). P. Ney, M. Fontana, A. Maillard, and K. Polgar, “Assignment of the Raman lines in single crystal barium metaborate,” J. Phys. Condens. Matter 10, 673–681 (1998). Fig. 1. Compression window of MgOLN cut for type 0 interaction. (a) Cascading quadratic nonlinearity (using d33=25 pm/V at 1064 nm and Miller scaling to other wavelengths) and the native electronic Kerr nonlinearity from the so-called two-band model [4,30]. (b) Critical boundary of producing an overall self-defocusing nonlinearity and the stationary/nonstationary threshold of the cascading nonlocal response function. (c) Radiation in the nonstationary region, showing the resonant wavelength as a function of the effective phase mismatch, with the pump located at 1560 nm. (d) Degradation on the compression window when using a first-order QPM on MgOLN. Fig. 2. Simulations of NLS-like equation on the balance of the fast/slow pulses. Dispersion properties are chosen from an LN crystal. The cascading nonlinearity is Ncasc=2.60 and the material electronic Kerr nonlinearity is NKerr,el=1.96; the input pulse has a FWHM=50 fs and a peak intensity Ipeak=100 GW/cm2, located at 1560 nm. (a) Shock front on pulses and slow pulses driven by dispersion. (b) Slow pulses in QPM crystal without Raman effects, in which Δkeff=129.5 mm−1. (c) Fast pulses driven by 50% Raman effects in a bulk crystal with Δk=319.5 mm−1. (d) Balanced pulses generated in a QPM crystal with 50% Raman effects. The inset figures correspond to the spectrum evolutions, the temporal profiles, and the spectra at the first compression point of the pulses (position marked by the white dashed line). Fig. 3. Simulation of cascading nonlinear soliton pulse compression in BBO cut for type I interaction at 1030 nm. The rotation (θ,φ)=(20.5°,−90.0°), under which Δkc=78.1 mm−1 and Δksr=46.1 mm−1. Native phase mismatch Δk=55.4 mm−1. The launched pulse has FWHM=200 fs, peak intensity Iin=100 GW/cm2, ncasc(2)=−7.86×10−20 m2/W, nKerr,el|o:ooo=5.67×10−20 m2/W, Neff=6.00. (a) Electric field of the first stage soliton (position marked by the white dashed line). (b) Temporal evolution of the FW. (c), (d) Spectral evolutions of both o-pol and e-pol pulses. Fig. 4. Simulation of cascading nonlinear soliton pulse compression in MgOLN cut for type 0 interaction at 1300 nm. The rotation (θ,φ)=(90°,90°), i.e., X-cut, under which Δkc=890.4 mm−1 and Δksr=283.3 mm−1. Native phase mismatch Δk=501.5 mm−1. The launched pulse has FWHM=50 fs, peak intensity Iin=100 GW/cm2, ncasc(2)=−40.05×10−20 m2/W, nKerr,el=22.56×10−20 m2/W, Ncasc2−NKerr,el2=2.05. (a) Electric field of the first stage soliton (position marked by the white dashed line). (b) Temporal evolution of the FW. (c) Spectrum of the first stage soliton. (d) Spectral evolution of the e-pol pulse with obvious red shifting of the FW and blue shifting of the D-wave. Fig. 5. Simulation of cascading nonlinear soliton pulse compression in PPMgOLN cut for type 0 interaction at 1300 nm. The poling period is 26 μm. The rotation (θ,φ)=(90°,90°), under which Δkc,QPM=360.9 mm−1 and Δksr=283.3 mm−1. The effective phase mismatch Δkeff=259.8 mm−1. The launched pulse has FWHM=50 fs, peak intensity Iin=100 GW/cm2, ncasc,QPM(2)=−31.32×10−20 m2/W, nKerr,el=22.56×10−20 m2/W, Ncasc,QPM2−NKerr,el2=1.45. (a) Electric field of the pulse (position marked by the white dash line). (b) Temporal evolution of the FW. (c) Spectrum of the pulse. (d) Spectral evolution of the pulse with resonant SH radiation and strong dispersive wave.